What are the best online bookmakers for esports betting in Turkey? That is what we are here to find out. 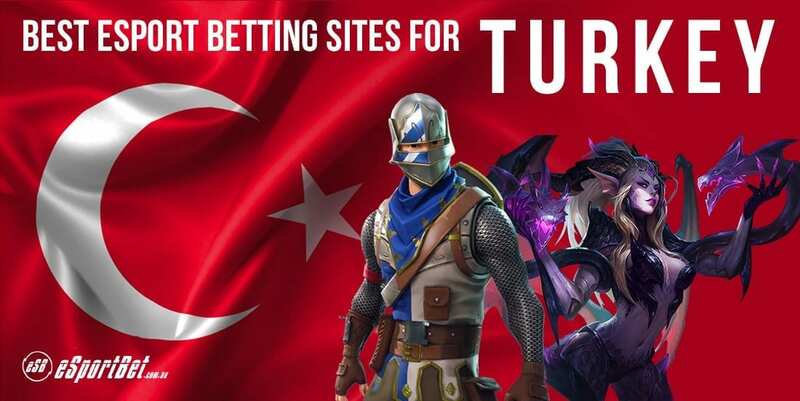 The bookies below all accept Turkish gamblers and offer complete markets for top games such as League of Legends, Dota 2, Overwatch and more. Read on to learn more about Turkish gambling laws and the best ways to fund your online betting account. Is online gambling legal in Turkey? In a word, no. The Turkish government banned online gambling in 2006 and further tightened the prohibition in 2013, when the nation became one of the first to target individual gamblers. Anyone caught using an online gambling service in Turkey – besides the state-owned IDDAA sports betting firm – may be fined up to 3000 lira (~US $600), while directors of complicit betting operators and banking services can face severe sanctions and even jail time. For all that, Turks continue to gamble online in great numbers. In 2013, after the new penalties came into effect, a major European bookmaker reported that nearly a quarter of its total business came from Turkey. To this day, many prominent overseas betting operators accept Turkish gamblers despite the nation’s prohibitive laws. So, there you have it: while online gambling is illegal in Turkey, millions of residents pay those laws no heed whatsoever. What you decide to do with that information is up to you. First, you need to choose a reputable, licensed betting site that covers esports and accepts gamblers from Turkey. Our recommended operators tick all the boxes for value odds, market range, bonus offers, secure banking and customer service. We suggest signing up at as many bookies as possible so you can compare the odds and guarantee the best possible value whenever you bet. Getting started is a piece of cake. Tap one of the ‘Bet Now’ links above to visit the bookmaker’s website, then follow the prompts to create a new betting account. Enter your details, opt in to any bonuses you wish to claim, choose a deposit method and add some cash to your balance. The whole process is easy, safe and takes only a couple of minutes to complete. The best Turkish esports bookies cover all the major gaming leagues and tournaments. Follow the links below to read our in-depth betting guides for the world’s most popular esport games. Credit and debit cards – All reputable gambling sites accept deposits with Visa and MasterCard. eWallets – Neteller, Skrill and PayPal are widely accepted for both deposits and withdrawals. Pre-paid solutions – Paysafecard vouchers are available at various retail outlets all over Turkey. Direct banking – Citadel Direct allows for instant transactions from your personal bank account. Wire transfer – Although payments take a few days to clear, standard banking is ideal for large transactions. Cryptocurrency – Many online bookies now support Bitcoin, Ethereum and other popular cryptocurrencies.